According to the documents described in this article, Katherine Plunket was born in Ireland on 22 November 1820 and died there on 14 October 1932 at the age of 111. She therefore became a super-centenarian on reaching the age of 110 in 1930. She is one of the select band of eight cases who were identified by the American actuary Walter Bowerman (1939) as having died at ages 109-113 in the United States, Canada, Great Britain and Ireland over a long period. Since then, some of these cases have been shown to have been invalid, due to mistaken identity. However, when the case of Katherine Plunket was investigated by Julia Hynes, then at the Cambridge Group for the History of Population and Social Structure, she (Julia) was able to trace a large number of relevant documents, which place Katherine Plunket in a different category and make a strong case that she was a genuine super-centenarian. The investigation was made easier by the fact that Katherine Plunket was a member of the Irish aristocracy. She was a grand-daughter of a Lord Chancellor of Ireland, who became the first Baron Plunket. Her father, who was a junior clergyman when she was born, later became a Bishop. He also inherited the title and became the second Baron Plunket. Her mother was the daughter of a Speaker of the Irish House of Commons and was related to the Earl of Clermont. Her first and second cousins included three titled members of the aristocracy. When she was baptised, her Christian name was recorded as Catherine, but in later life she spelt her name with a K. As the daughter of a baron, her full title was the Honourable Katherine Plunket. She had regular entries in the reference books of the period, namely Whittakers Peerage, Burkes Lodges Peerage and Baronetage, and Kelly’s Handbook to the Titled, Landed and Official Classes. Katherine Plunket was the eldest of six children, though one of these died soon after birth. She inherited a house in Ireland. She also, for a time, had a house in London. She travelled extensively, often with her younger sister Gertrude, and visited almost every capital in Europe. She was an amateur artist and made many sketches in Italy and Switzerland. She never married and she outlived all her sisters. After her sister Gertrude died in 1924, she lived alone with her servants but continued to be visited by other members of her family. When she reached the age of 109 she was sent a telegram of congratulation by King George V. Julia Hynes traced many articles about her in the Irish newspapers on her 103rd, 107th, 108th, 109th, 110th and 111th birthdays. When she died, King George V sent a telegram of condolence to her relatives. She had obituary notices in the London newspapers The Times and The Morning Post, and in the Irish newspapers. 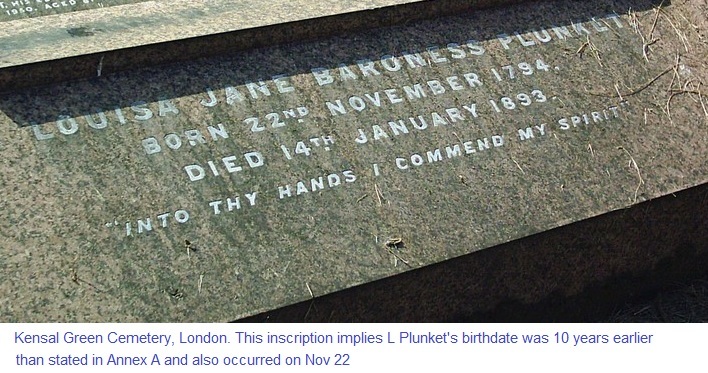 Catherine Plunket was born on 22 November 1820 at Kilsaran, County Louth, Ireland, where her father was a curate. She was baptised in Kilsaran Church on 13 December 1820. According to a newspaper report the original parish register has not survived, but there is a copy of her baptismal entry in the International Genealogical Index (IGI). There is also additional evidence of her birth: she was recorded in the Census of Ireland in 1821. Annex A gives the details of all the members of her immediate family (parents and siblings) and the dates of their births, marriages and deaths. It also gives the details of the registration of her death in 1932. Annex B gives information from the Census of 1821, relating to the very beginning of her life. Annex C is an article which was written by her cousin, David Plunket, and which was published in the London magazine The Spectator on 27 December 1930. This gives a most informative account of her life and her later years. Copies of all the documents mentioned above are held by the Cambridge Group. These include copies of the baptismal entry in the IGI, the death registration, two telegrams from King George V and the many newspaper articles, together with extracts from the diaries of her sisters Gertrude and Frederica. It is right that all possibilities of error in the case of Katherine Plunket should be considered and examined critically. First, we note that Katherine Plunket’s mother, born in 1804 and married in 1819, was very young when Katherine was born in 1820. However, this is not at all impossible. Moreover, even if there was some mistake about the date of birth of the mother, this does not affect the evidence for the date of birth of Katherine Plunket. Next, one must consider the remote possibility that the Katherine Plunket who was born in 1820 later died and was replaced by another child, also called Katherine. There was not enough time for this to have happened between the baptism in 1820 and the census in 1821. There was very little time for it to have happened between 1821 and the birth of the next sibling, Emily Anne, in 1823. If it happened after that, the other siblings would hardly have regarded Katherine as their elder sister. Next, at the request of the Editor, we must comment on a theory put forward by a sceptic that the sibling who died in 1924 was not Gertrude Plunket, but Katherine Plunket herself, and that Gertrude impersonated Katherine Plunket for the rest of her life in order to prevent the inheritance from passing to a nephew. It seems improbable that Gertrude, a lady in a pious Victorian household and the daughter of a Bishop, would suddenly take to serious crime at the age of 83. Is seems even more unlikely that the dispossessed nephew and the rest of the family would not have noticed, that the doctor who signed the certificate of cause of death in 1924 would not have recognised his own patient, and that the person who registered the death would have deliberately made false statements on a legal document. Next, one must consider the possibility of mistaken identity. The relevant thing here is that Katherine Plunket was surrounded by her immediate family (her parents and then her younger sisters) from birth until she was well over 100 years of age. She was a householder and had servants. She was a member of a famous family. Her existence was recorded regularly in the reference books. On this evidence of her life, there seems little room for mistaken identity. Finally, there is the question of demographic plausibility. Wilmoth and Lundström (1996) have analysed the maximum ages reported each year in five countries since 1903. The age 110 does not appear in their tables until the year 1945, in France. However, this does not mean that it was impossible for the age of 110 to have been reached in Ireland in 1930. In England and Wales, ages of 107 were recorded in 1914, 1923, 1924 and 1929; ages of 108 in 1911, 1931 and 1933; and age 109 in 1935. The case of Mme Calment has shown us that it is not at all impossible for exceptional people to outlive their contemporaries by several years. Katherine Plunket only lived for three years longer than her contemporaries. The author would like to acknowledge the work and initiative of Julia Hynes in tracing the documents described in this article. Catherine/Katherine Plunket was born on 22 November 1820 at Kilsaran, County Louth, Ireland. She was baptised at Kilsaran Church on 13 December 1820. In the IGI Copy of her baptismal entry, her name is given as Catherine Plunket and her parents as Thomas and Louisa J Plunket. 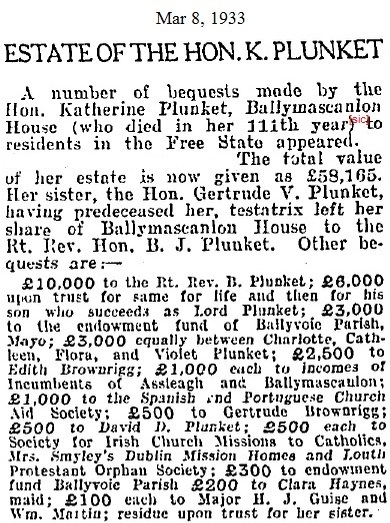 Katherine Plunket died on 14 October 1932 at Ballymascanlon House, County Louth, Ireland. Her death was registered on 17 October 1932 in the district of Ravensdale in the union of Dundalk in the county of Louth. Her name is given as The Hon Katherine Plunket, spinster, aged 111 years and 11 months, occupation Lady. The certified cause of death was syncope. Father: Thomas Plunket (later 2nd Baron Plunket and Bishop of Tuam). b.1792 d.1866 aged 74. Mother: Louisa Jane Foster (2nd daughter of John William Foster and Rebecca M’Clure). b. 1804. d. 1893, married to Thomas Plunket on 26 October 1819 at Kilsaran, County Louth. At her baptism, Catherine/Katherine Plunket was ‘of Milestown’. Milestown, in the Parish of Gernonstown, was the home of Mrs. Plunket’s mother, ‘Rebecca Foster, farmer and lady’ according to the Census Return. Mrs. Foster was the holder of Pew 19 in the Parish Church in 1821. Rebecca was the daughter of Hamilton McClure by his wife, Elizabeth Weld (married 1762) of Dublin. Rebecca McClure married in 1788, John William Foster M.P. for Dunleer, son of William Foster, also M.P. for Dunleer, by his wife, Patience Fowke, whom he married in 1743. Rebecca’s grandfather was John Foster of Dunleer, County Louth, who married in 1704, Mary Fortescue, 1st cousin of Henry-William Fortescue, created 1st Earl of Clermont in 1778. The Census Returns listed above were lost in the Civil War which followed the establishment of the Irish Free State. Canon Leslie copied the entry for the entire parish of Kilsaran – or rather the United Parish of Kilsaran – which included Gernonstown called Castle-Bellingham, County Louth, where he was Rector from 1899. Note: We do not know in what month the Census Returns for 1821 were recorded in County Louth. One often sees photographs in the newspapers of some old man or woman who has reached the remarkable age of one hundred or even one hundred and two, and one sometimes hears that in a certain village there is an old inhabitant who is said to be one hundred and five or more, but no one really knows exactly how old these people are. I have, however, a cousin who really is one hundred and ten years old, for the authentic record of her baptism, dated December 13th 1820, together with that of the marriage of her parents, is written down in black and white in the Registration Book of the little Church of Kilsaran, in Ireland. The Hon. Katherine Plunket was born at Milestown, Co. Louth, when her father was curate in charge of Kilsaran parish. 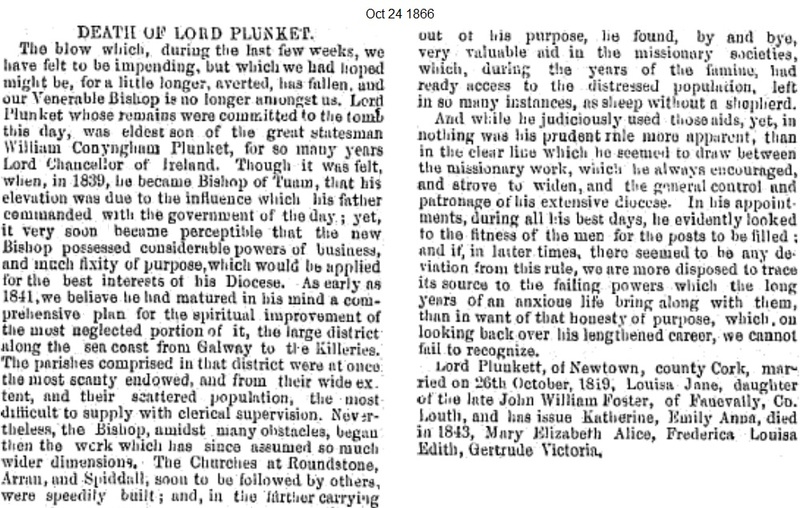 Later he was made Dean of Down, and finally Bishop of Tuam, so Miss Plunket’s early days were spent first in the North and then in the West of Ireland. Railways, of course, were unheard of in those days, and the journey from Tuam to Dublin which now takes a few hours, was in those days a vast and complicated undertaking, for if the weather was bad Dublin was not reached in less than two or three days by the stage coach. Miss Plunket can remember that once or twice she went by canal most of the way, and when the slower, though safer, route was taken, the journey ran into five or six days. My cousin has lived through no fewer than five reigns, and is one of the most loyal residents in Ireland. She takes the keenest interest in the Royal Family, and was as excited as anyone about the recent birth of the little Princess Margaret. She has lately been the proud receiver of a telegram of congratulations from their Majesties the King and Queen on her one hundredth and tenth birthday, on November 22nd. For the last forty years she has lived at Ballymascanlan House, Co. Louth, which she inherited from her uncle, Mr. Frederick Foster. When we were children we used to look forward with great excitement to going and staying there. Her younger sister, Gertrude, used then to keep house for her, and we always had a wonderful time, as my cousin was fond of children and always made them feel thoroughly at home with her at once. When we left, we used to be given five shillings each, and we were always told to spend it wisely! She treated Miss Gertrude as if she were a young lady and she herself her mother, whereas she was only twenty years older. When Miss Gertrude travelled to Dublin my cousin refused to allow her to go without her maid, as she said that Dublin was far too big a place for her sister to go about in alone. Miss Gertrude was then seventy-five! When Miss Plunket was one hundred and two she was forced to her bed by a bad attack of bronchitis, and when she had finally shaken it off her doctor advised her to remain in her room. She resigned herself to this calmly, and left the management of her garden and estate entirely in the hands of her sister. When Miss Gertrude was in her eighty-fourth year she succumbed to a heart attack and left poor Miss Katherine alone. This catastrophe, we felt sure, would shake my cousin so much that she would soon follow her sister. We found, however, that we were much mistaken, for shortly after her sister’s death she announced that she would have to ” pull herself together” in order to take on the duties her sister had been forced to forsake. This she not only said but did, and she has been stronger and in better health during the last few years than she has for many years past. Until quite a short time ago she used to sign all her cheques, and even now she likes to know exactly how her money is being spent; her pass book is generally on her table beside her bed, and she herself arranges the details of her financial transactions. She thinks that her bank is just as it was when she was last in it, and that the manager stands behind the counter dealing out or taking in money from his various clients, and that he certainly reads and attends to all the letters personally, for she has often told me that she considers Mr. Coutts a most capable and reliable man! She very much resented a message from a relative who, a short time ago, offered her his well-meant advice on an investment, and stated that she was well able to manage her own affairs. In 1825, when Sir Walter Scott paid a visit to Ireland, he stayed for a short time with the first Lord Plunket, who was then Lord Chancellor of Ireland, at Old Connaught House, Bray. Miss Plunket, who was aged five, was also paying a visit to her grandfather, and can remember being brought down from the nursery and sitting on Scott’s knee. This is one of her first recollections. Miss Plunket was very keen on travelling in her younger days, and has visited nearly every capital in Europe. She was also very fond of sketching, and the walls of many of the rooms at Ballymascanlan are adorned with her sketches of Italy and Switzerland. Last summer Miss Plunket was in better health than usual, and for some weeks she sat up in a chair each day for a few hours. She never has allowed things to worry her, and has always believed that anything good comes from God, and anything bad has been sent for her good. Her appetite is just the same as any normal person’s. She is extremely fond of game, and for many years past she has eaten roast turkey and plum pudding, and drunk champagne on her birthday. She has always been an excellent sleeper, and on days when she is not feeling well, instead of worrying, she enjoys a good day’s sleep. When I go to see her, it seems impossible that she should be such a great age; she is so clear in her mind and so interested in doings of the great world outside. She always enjoys a joke, and has a very strong sense of humour. She likes to know what we young people are doing, and loves hearing about our dances and parties, and thinks all young people should enjoy themselves. She readily accepts the fact that modern young men and women enjoy far more liberties than they did in the days of her youth. The papers are read to her regularly, and she has always been a keen reader and admirer of the “Spectator”. It gave her special pleasure last year when she received a letter of congratulations on her one hundred and ninth birthday from the Editor. Measure: 15 by 20cm., 6 by 8in. An album (originally a scrapbook from Ballymascanlon, Co. Louth, with seventy-three drawings (including two watercolours) mostly in pencil and a small number in ink, and the views are mainly of Italy, Switzerland, Germany, France and Austria. Katherine Plunket (1820-1932) an Irish aristocrat from Co. Louth, was a prolific botanical artist. She was born at Kilsaran near Castlebellingham, eldest of six children, one of whom died in infancy. She was the granddaughter of William Plunket, Lord Chancellor of Ireland, who became the first Baron Plunket. Her father was Thomas Plunket (1792-1866) a junior Church of Ireland Clergyman who later became the Bishop of Tuam, Killala and Achonry and after his father died became the 2nd Baron Plunket. 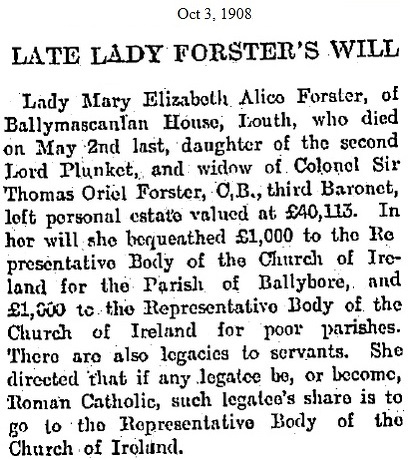 Her mother was Louise Jane Foster of Fanevalley, Co. Louth and and daughter of the MP for Dunleer. Katherine inherited from her mother one of the family’s ancestral homes, Ballymascanlon House, near Dundalk and oversaw its upkeep until she contracted bronchitis, aged 102. With her younger sister Gertrude (1841-1924) she travelled widely visiting almost every capital in Europe. With her sister Frederica she made many sketches of flowers in France, Germany and Ireland. In 1903 these were bound in a volume and presented to the Royal College of Science Art in the National Museum of Ireland. In 1970 it was part of the collections which were transferred to the Irish National Botanic Gardens at Glasnevin. The volume in the Garden’s library contains 1,200 paintings by Katherine & Frederica all executed during their trips to Europe. Akin to the drawings in this album, they too were unsigned.